(Newser) – The name might not ring a bell, but those who followed the 2018 Winter Olympics might remember the unusual story of Elizabeth Swaney. 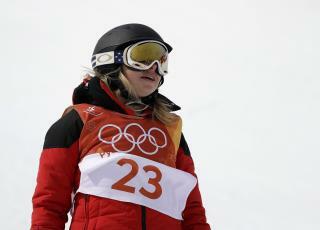 She's an American, but she skied for Hungary (where her grandparents are from) in the women's halfpipe. Typically, skiers in this event do all kinds of death-defying tricks. Swaney did none; instead, she skied down (relatively) matter-of-factly and finished dead last, recording one of the lowest scores ever in the event, writes Davy Rothbart for the California Sunday Magazine. Swaney, now 34, endured a lot of hate for that, with critics saying she had no business competing in the Games. But in his profile of her, Rothbart writes that critics might be missing the larger point. Swaney long had a single-minded mission to compete in the Olympics, and she found a way to get it done. Turns out, she's been doing things like that her whole life. Pretty strange. I don't like competition. If I win I feel too bad for the loser. I don't get her but perhaps she is only suiting herself. Still, strange. If I was going to do it I would have to give it my all. She may be a Harvard grad, but she needs to stay on the bunny slope while skiing. I hope she didn't graduate with a 2.1 GPA. How is her backstory "even better" or "fascinating"? It's quite ridiculous and shameful.